One chapter from the classic children's story The Phantom Tollbooth reminds me of how Reinhold stressed that seeing is an aggressive act. In the story, the main character, a young boy named Milo, visits two cities. One is called Illusions, where nothing that is seen is real. The second is called Reality, where all the buildings are invisible. The people of Reality walk around with their heads down, unaware that their whole city is invisible. 'Didn't they have any place to go?' asked Milo. Because the world around us is changing, if you don't pay attention, you might miss your chance to see something in quite the same light ever again. I've returned from my school trip to France. After 11 days of sight-seeing and learning, I've returned with a book full of sketches, a bag full of books, and a head full of ideas. Since there were no posts while I was away, here are links to a couple of files I've been working on which fans of Marxhausen will enjoy. Both of them are scrapbooks Reinhold made. One is called New Forms of Worship, and shows artwork and worship spaces along with his notes on them. The second, A Time to See, should sound familiar to those who have seen his documentaries. The scrap book features several of the photos featured in the documentary he made, as well as multiple additional photographs in a similar vein. Hello blog readers! Tomorrow, I leave for France, and will return May 22. You'll have to wait til then for new posts, so today I'm just going to let you know what I've been working on recently. I've been scanning a few books created by Reinhold. These books were entrusted to me by Karl Marxhausen. So far, I have completely scanned two books, one of which is titled A Time to See and contains photos he showed and discussed in the film of the same name. It also includes many more photos not shown in the film, and tells the stories of the interesting things he saw and how he found them. I'll be sharing my favorite highlights from his many sketches and notes here shortly after I return, so check back later this month! For today, I'd like to share this text of a school chapel Reinhold wrote. Pastor Bruick of St. John Lutheran Church in Seward shared this story at the memorial service for Reinhold. When Reinhold originally delivered this message, the pine coffin he built was sitting on stage. Even though we know that Christ has conquered death. My hair used to be black. I’m changing. I’m dying. This is my casket. I paid $130.00 for it. I put it in the garage. I did not open it for a long time because I was afraid. Last summer I glued the pieces together. It sits in my studio. I see it whenever I work. I stand in it most every day. But this day may be my last. full of life ahead to look forward to. Some of you will die before me. Farmers don’t throw their seeds away. Old and shriveled people and seeds become new after death. This box is a symbol. A new space capsule for my meeting with God. A great new adventure lies before me. This box reminds me every day of God’s grace and love. Marxhausen designed the stain glass windows in St. John, which can be found on either side of the sanctuary, the ceiling, and on both the stair cases leading to the orchestra pit. Here is a link to a radio broadcast about Marxie, including an interview with William Wolfram! Today, I visited Link Library at CUNE and checked out the book "Sound Sculpture: a collection of essays by artists surveying the techniques; applications; and future directions of sound sculpture." It was edited by John Grayson and the back of the book describes it as "The first publication to deal completely with this new art form." Part I of the book is devoted to senior artists active in the field of sound sculpture, which is where Reinhold is featured. In his essay, Marxhausen relates the stories of different objects he worked with to create musical sounds. As a young boy on the farm, Marxie collected discarded whiskey bottles (unbeknownst to his father, a minister). Another story was playing the musical saw with the Lincoln Nebraska symphony. I plan to post the full text of Reinhold's essay in future. This book lends further creedence to Reinhold's status as a "founding father" of an artistic movement within sculpture. For those who have been fascinated by the musical works by Reinhold, such as his star dusts, cosmic cubes, and head sets, here is a list of names of other artists featured in the book for you to research: Bernard Baschet, Francois Baschet, A. Villeminot, Harry Bertoia, Allan Kaprow, Stephan Von Huene, David Jacobs, and Charles Mattox. The Sower, Vol. 23, No. 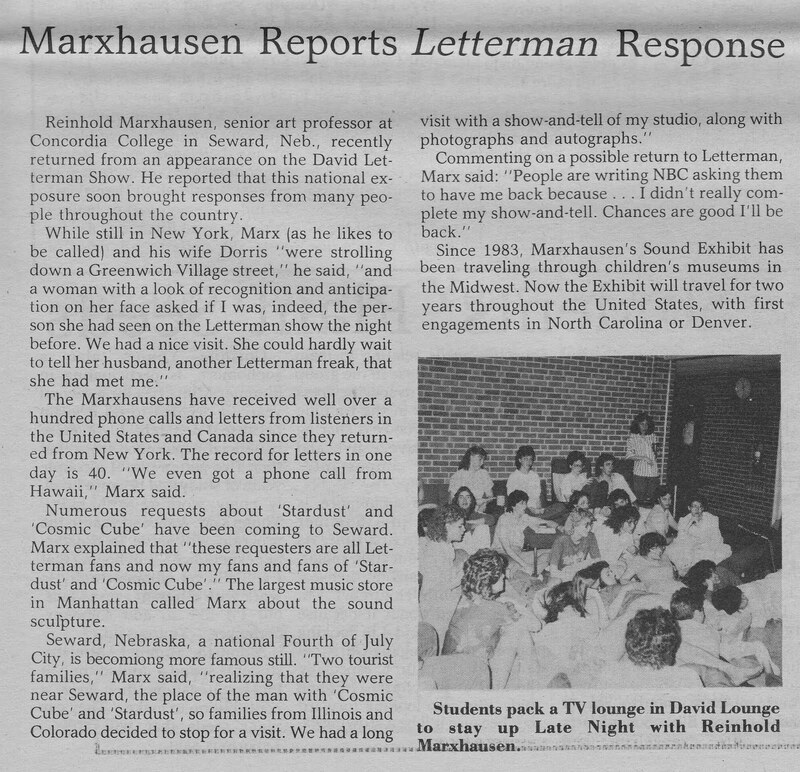 8, May 1, 1986, page 3. 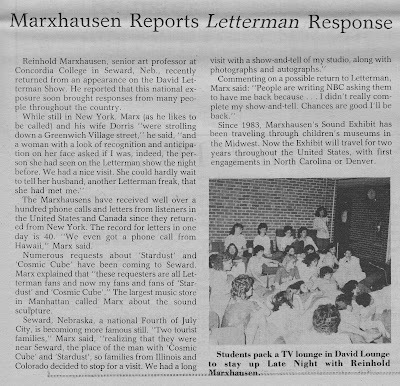 This article contains an interview where Marxhausen talks about his appearance on the David Letterman show.